Intermediate students of the new St. Aidan Elementary School in Brampton participated in an ACCESS awareness and motivational presentation April 30, 2008 in the school's library. 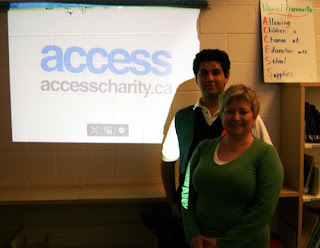 Students were very responsive and the school presented ACCESS Charity with a cheque of over $100 raised by the students prior to the visit. Thank you especially to Ms. Denise Tonon, the Teacher-Librarian at St. Aidan School for all of her support and coordination. Now Registered as a Non-Profit Corporation!